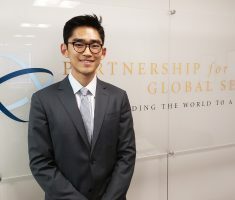 Mr. Daniel Kim is a Senior Program Associate at the Partnership for Global Security (PGS). His primary research focuses on global nuclear security policies, geopolitics, nuclear energy, climate change issues, and new approaches to 21st Century challenges. He provides program management and support for the Global Nexus Initiative, Nuclear Policy Leadership Initiative, and the Initiative on Nuclear Security, Governance, and Geopolitics. Mr. Kim obtained a dual B.A. in International Affairs (concentration in Security Policy), and Economics from the George Washington University, Elliott School of International Affairs. He is interested in various global policy issues involving nuclear nonproliferation and security, and the geopolitical implications of climate change and nuclear energy.